The exact timing of the Hadean/Archean boundary is still controversial due to the sparse rock record but is usually set at 3800 Ma. This time marks the end of the Hadean heavy meteorite bombardment, allowing the survival of the early Earth’s crust. Studies of Archean rocks reveal that the early Earth was quite different from that of today. It had an inhospitable environment with superheated water, an oxygen-starved and poisonous atmosphere, intense volcanism, and was under constant bombardment by meteorites. Hot, steamy, barren and explosive, the Archean landscape was uninviting. Yet, it was here that life began. Geologists recognize that today’s continents are built around cores of extremely ancient cratons called “Precambrian Shields”. They comprise two types of rock association that developed mainly during Archean time: the low-grade granite-greenstone belts and the high-grade gneiss complexes, and are products of the differentiation of small proto-continents, which then collided to form larger landmasses. 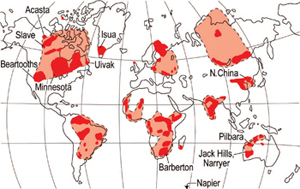 Global distribution of Archean rocks in modern continents. Known (red), suspected (pink). 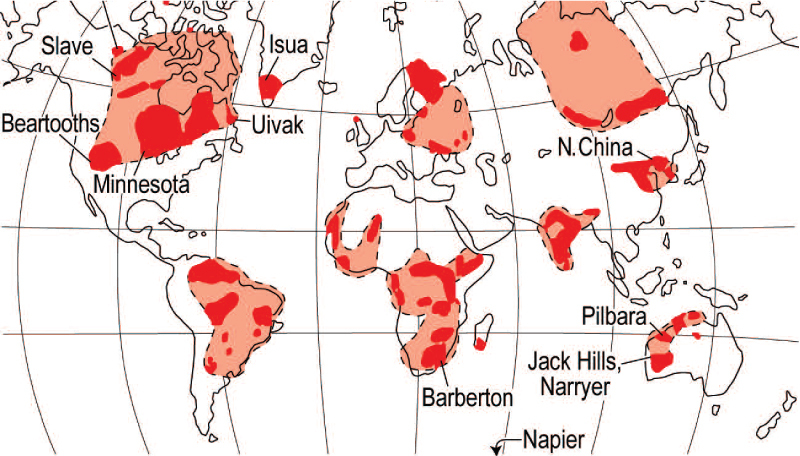 Areas with rocks or zircons older than 3.6 billion years are labelled by name.